The Nancy Lou, with a view from the bridge! 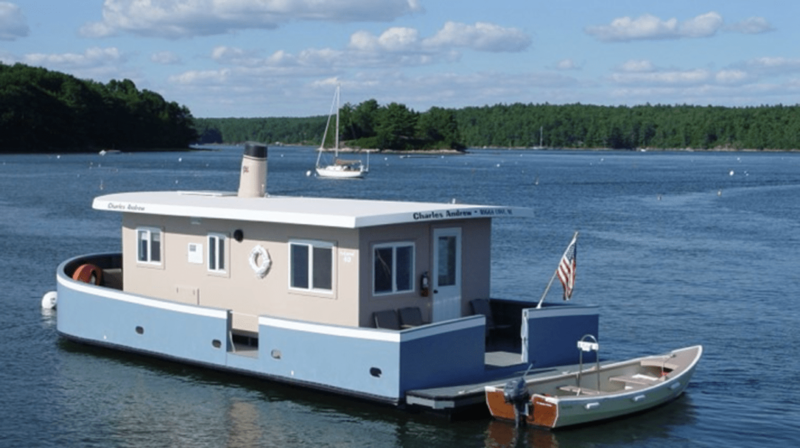 Experience the peace, beauty and wonder of life on the water in Riggs Cove, Georgetown, Maine. No boating experience required! The Nancy Lou has a roof top deck (Sun Deck) for you to relax and enjoy the surroundings as well as accommodations for five. The private forward bedroom (cabin) features a queen sized bed with doors forward to the front deck and aft to the kitchen (galley) and bathroom (head). The salon area converts to sleep two, and the settee pulls out for one. A walk-in shower and on-demand hot water, a three burner stove with oven, a refrigerator, lobsters from passing lobstermen, a loaf of bread, a jug of wine and thou. Birthday, anniversary, honeymoon, kid's science project? Just hangin' out on the mooring, exploring the coves in the skiff, paddling kayaks (two on board), watching boats, watching nature and being one with the sea. All the comforts of home are on Nancy Lou. Bright an airy interior with a full galley on each boat. U-shaped dinette converts into a double berth. 19′ TV for DVD player located in the galley (bring your DVD’s, as no channels are available). Large head, with sink and full sized shower. Extra linens and soap. Bedroom with queen sized bed, and plenty of room for extra blankets and luggage. Three burner propane stove with oven (tea kettle, silverware, dishes, and cookware included). Outdoor grill, and four to six outdoor seats. Solar panel and major battery bank will provide 12V and 110V power. Two kayaks (per house boat), each with paddles and necessary safety gear. Plenty of extra docking space for other boating toys you might bring along. The Typhoon, an 18′ daysailer, available free of charge. The Maid Marion, a 15′ row boat, available free of charge. Free wi-fi connection ashore via the Library or Gallery. Dock crew available twelve hours a day seven days a week (during Peak), providing outboard fuel, ice, daily newspapers, etc. upon request. Call us directly to book today and get the best price on a unique vacation.